I wish that I had a better picture for this scoodie, but unfortunately, it was one of those projects that I finished and then wrapped right away. I made this for my pre-teen neice, who I thought would enjoy the bright colors and unique design. Chain 16, dc in third ch from hook and next 13 st (14 st) *you can make this wider if you like, just add more chains and st across the row. R2: ch 3, turn, sk first st, dc in next 13 st.
Repeat row 2 until your scarf is a desired length for your recipient. Find the center stitch of the scarf and place a marker. count from the marked stitch outward on either side and place a marker at 17 st.
R1: Join MC with a sl st to one of the outer marked st. Ch 2, dc in each st across to the other outer marked st, moving center marker up a row. Turn. R2: ch 3, dc in each st until one before marker, 2 dc in next st, dc in center marked st (move marker up), 2 dc in next st, dc to end. R9: Ch 2, dc in each st until 2 before marker, dc2tog, dc in center, dc2tog, dc to end, turn. R16: Fold hood in half and either sl st across through both sides or FO and use a long tail to sew the seams together. Weave in ends. *Skip next 2 st, 7 dc in next, sk 2 st, sc in next* repeat around. You may have to adjust the length of one of the shells depending on the length of your scarf. Make sure that you finish a scallop at the corner, then turn the corner and start another scallop. Work this way around the whole scoodie, FO and weave in ends. Round 7 : ch 1 , (sc,7 dc, sc) in each ch-4 spaces, fasten off. 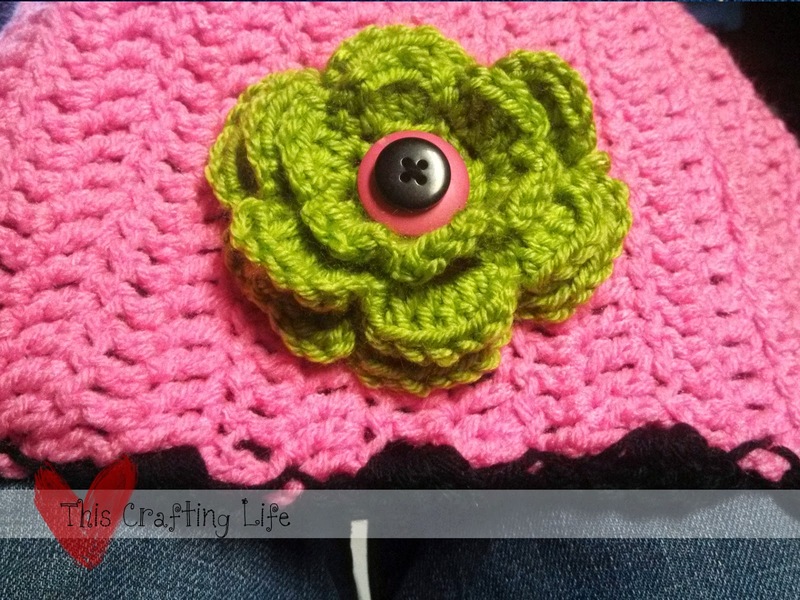 Sew buttons to center of flower and attach flower to scoodie.